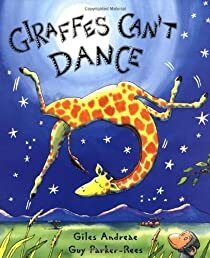 Giraffes Can't Dance | Your #1 Source for Kindle eBooks from the Amazon Kindle Store! Gerald the giraffe doesn't really have delusions of grandeur. He just wants to dance. But his knees are crooked and his legs are thin, and all the other animals mock him when he approaches the dance floor at the annual Jungle Dance. “Hey, look at clumsy Gerald,” they sneer. “Oh, Gerald, you're so weird.” Poor Gerald slinks away as the chimps cha-cha, rhinos rock 'n' roll, and warthogs waltz. But an encouraging word from an unlikely source shows this glum giraffe that those who are different “just need a different song,” and soon he is prancing and sashaying and boogying to moon music (with a cricket accompanist). In the vein of Rudolph the Red-Nosed Reindeer, Gerald's fickle “friends” quickly decide he's worthy of their attention again.